"Even Zingbot couldn’t save Fessy from a Terrible Week on Big Brother"
Zingbot, the bitterly sardonic robot that isn’t afraid to tell the houseguests what he (or producers…or America) thinks about them is not known for understatement. But telling Faysal (Fessy) “I was surprised to hear you were a part-time teacher, because you are a full-time moron! Every child left behind! Zing!” and have that still be an under-statement about the quality of his “head of household” week may indeed be an accurate summary of this week’s Big Brother. Sadly, no one likes a rout, and this week’s Big Brother seemed to reinforce that only one side of the house has a chance to win Big Brother. And unlike shows like Survivor, that can change momentum through clever tribe changes, BB relies on contestants using some intelligence (and let’s just say that intelligence was missing this week). And I do mean Great. It might even be legendary. Although their own alliance totaled pretty much 3 (Faysal, Haleigh, Scottie) with a chance of a few floater votes, Faysal apparently heard demonic voices in his head telling him to put up…Scottie! This wasn’t to enact a sneaky backdoor plan. This wasn’t to create an epic game move. This wasn’t even an attempt to nominate someone weak so a stronger player could get sent home. No, my friends, he just decided Scottie was… shady. His shomance partner, Haleigh, told him time and time again that Scottie was friend, not foe. But in true caveman form, Fessy decided to go ahead with his plan (thanks in part to some “trickery” by Level Six and JC that probably wouldn’t convince anyone with an IQ above that of a stuffed animal or half-dead houseplant) that Scottie hasn’t been voting with him and also has romantic feelings for his girl Haleigh. And to the sheer delight of Level Six he made his fantastically imbecilic move of nominating Scottie and then gloated over it. He also nominated Brett because he wanted to nominate “two guys” on his Head of Household. Strangely, later in the week, when he had to name a replacement, he would name… a woman. Sad but True Zing--“Haleigh: You were so good at reading Hamlet, but your real Shakespearean tragedy was your HOH reign” (referring to last week, when her good friend was sent home on her own watch). While Zingbot disappointed a bit this year, Big Brother’s quest to continue to make fun of current events gets a thumbs-up this week. Instead of the golf-course home where President Trump spends most of his weekend time, Mar-a-Lago, Zingbot helped the contestants battle for a Power of Veto competition at “Zing-A-Lago,” where each contestant had a portfolio of “secrets” to hide inside the Big Brother house. This is always a fun competition to watch, particularly if you have an OCD person to watch this episode with you, since it involves houseguests hiding their object so others can’t find it, and then tearing up everything in sight in the house in order to search for their competitors’ objects. (I will plead the Fifth, by the way, whether the completely torn-up BB house looks neater than my work desk at school during the year, but let’s just say I should probably take a plea deal). I had no qualms with this year’s messy-hide-and-seek event, other than it proved what I said last week was even more correct: this year’s houseguests are lazier than ever. Brett practically hid his portfolio with a blinking neon sign by dragging mattresses from other rooms over it. Anyone running into the house looking for a missing item would note “this shouldn’t be here!” and should have simply looked under that pile. His strategy of winning by defense (I’m going to pile everything on mine!) was so blatantly obvious to anyone who has ever seen the show before that all the houseguests had to do was dig out his item. Tyler at one point tried, but decided it wasn’t worth the effort. But this is BB20, where moving mattresses off an object is apparently too much work for our Millennials or Gen Z folks, who just… gave up. In most seasons, Brett’s folder would have been the first to be found by resourceful, game-intelligent players. But in this season, his less motivated houseguests seemingly looked at his stack of mattresses and decided to ignore them, and he won. That created a bizarre moment where Sam (I’m evvvvvveryone’s friend except Haleigh) decided to try to convince Fessy to put up Haleigh (his shomance!) 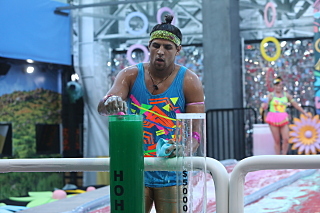 as the replacement nominee, but Fessy wasn’t quite that gullible. While CBS edited the show to make us wonder what would happen, it was obvious from HOH on that Scottie would go home and alas, it was unanimous. This week was all a train wreck from the time caveman Fessy (must vote out Scottie since I think he’s shady even though he’s one of my only 2 allies in the house because he might like my girlfriend!) made up his mind in the first moments after winning HOH. Next week—someone from jury house gets to come back into the game!! Will that derail the snarky Level 6? Probably not. But one thing is for sure: there will not be a Head of Household with as little wit as Fessy. Unless, of course, a stuffed animal or houseplant is named HOH. And that might be more entertaining. Can. Anyone. Ruin. The. Game. More. Than. Fessy.